The fifth and final instalment of this landmark series cements both artists’ reputations as two of the leading Mozartians performing today. In the elaborate opening andante of the Sonata in A major, K12, a rising arpeggio figure in the left-hand keyboard part, echoed by the violin, punctuates the musical discourse until, in the closing moments of each half of the piece, the arpeggio is replaced by a rushing scale. The only remaining movement is a lively allegro whose final reprise is preceded by a turn to the minor bringing with it a touch of exotic chromaticism. The Sonata in G major, K11, is also cast in two movements, but the second of them, following an expressive andante, is really a pair of contrasting pieces rolled into one—a brisk allegro in duple time, and a minuet in the minor based on a closely related theme. Once the minuet has run its course, the allegro is repeated. Mozart’s output of early accompanied sonatas was completed in The Hague in February 1766 with a further set of six works, K26-31. After this, more than a decade elapsed before he returned to the genre during a tour which he undertook under the watchful eye of his mother (who, however, died before Mozart returned home) in 1777-8. Of the six new sonatas K301-306, four were composed in Mannheim in the early months of 1777, and two were added in Paris in the summer. On top of those, Mozart composed a further sonata, K296, which was not published until 1781. All but the last of the Mannheim and Paris sonatas are in two movements only. The opening movement of the Sonata in E flat major, K302, finds Mozart attempting to recreate the sound of the famous Mannheim court orchestra, and in particular the long crescendo over a repeated pedal-note which was one of the orchestra’s trademark effects. The opening subject, with its fanfare-like beginning answered by a smoother idea, leads to a long crescendo whose sonority is carefully built up over a span of nearly a dozen bars. The crescendo is followed by a quiet suggestion of horns on the violin, and by a series of expressive minor-mode phrases on the piano. The piano’s expressive phrases frame the development section, whose central stage features a dramatic return of the movement’s initial fanfare, accompanied by violin tremolos which conjure up the sound of orchestral strings. The fanfare appears at this point in genuine Sturm und Drang style, both in its original form, and—in another characteristic Mannheim gesture—upside-down. It is with the same fanfare, too, that both the exposition and recapitulation come to a close. The finale is an easy-going rondo whose contrasting episode is a delicately tripping staccato idea, presented for the most part in a sparse two-part texture which has the violin doubling the keyboard’s upper line at the octave below. At the end, the rondo theme, with its characteristic dactylic rhythm, is transformed into a closing subject of melting beauty, given out by the piano in smooth octaves while the violin provides a gently rocking accompaniment. The Variations in G major on ‘La bergère Célimène’, K359, were composed in the summer of 1781, probably for Countess Maria Karolina Rumbeke, who was Mozart’s first piano pupil after his arrival in Vienna in March of that year. 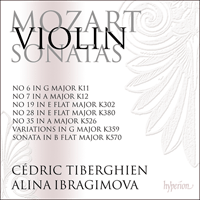 Mozart will have found the melody, together with that of another variation work for piano and violin, Auprès d’une source (K360), written around the same time, among the collections put together by the castrato and composer Antoine Albanese. The theme of the chanson ‘La bergère Célimène’ is of utmost simplicity. Its second half comes to a momentary rest on a fermata which also features in the variations themselves, and Mozart may have expected the player to improvise miniature cadenzas at these points. Of the twelve variations, the third is a piano solo with a left-hand part in constant semiquavers, while the seventh is a forceful march in the minor. The penultimate variation is an adagio whose ornate piano melody is accompanied in pizzicato; and the work ends with an allegro which transforms the gavotte-like melody into a livelier rhythm. The name of another of Mozart’s piano pupils, Josepha Auernhammer, appears on the title page of a set of six sonatas published in December 1781 under the imprint of the Viennese firm of Artaria, as Mozart’s ‘Oeuvre II’. Auernhammer was clearly a fine player: ‘The girl is a fright!’, Mozart told his father, ‘but plays delightfully; only the true delicate singing style in cantabile eludes her.’ Mozart performed his concerto for two pianos, K365, with Auernhammer, and composed the sparkling sonata for two pianos, K448, for her. The Sonata in E flat major, K380, the last in Auernhammer’s series, opens with imperious tonic chords dropping from one octave to the next. The chords form punctuation marks during the course of the piece, their appearance almost invariably heralding a startling change of key. The central development section at first takes off in a new direction, with a fanfare-like idea for the piano; but the chords soon make a return, leading to a dramatic passage in the minor. Right at the end of the development, the chords are subdued to a sudden pianissimo, and presented in note-values of twice their original duration—an effect which lends added impetus to the start of the recapitulation. The G minor slow movement, with its main theme featuring ‘sighing’ appoggiaturas, has an affecting mood of pathos, and its atmosphere looks forward to the variation slow movement, also in G minor, of Mozart’s piano concerto K456. The key of its beginning is not maintained for long, but the change to the major brings with it a barely altered form of the same melody; while towards the end of the movement’s first half, the theme—still in the major—assumes a rising shape that carries a still greater sense of yearning. The middle section introduces a new idea, accompanied on the piano in a manner that evokes the sound of murmuring clarinets. Gradually the music increases in intensity, until a rising chromatic scale leads into the reprise. This time, there is no turn to the major following the main theme. Instead, to the accompaniment of a winding line on the piano, the violin continues to develop the theme’s outline—and in particular, its sighing appoggiatura. The impression that Mozart has postponed the music’s melodic development from its normal position at the start of the second half of the movement to this later stage is strengthened by the fact that the actual development section had consisted entirely of new material. The finale’s ‘hunting’ theme is a precursor of the rondo from the K482 piano concerto in the same key. The theme’s tail-end, immediately preceding the violin’s first entry, features not only a sudden crescendo, but also a rhythmic acceleration resulting from a series of octave leaps which change the division of the bar, from two groups of three quavers each, to three groups of two. Once the lengthy opening paragraph has run its course, Mozart throws in a fanfare which seems to have horns and trumpets blaring away together, before a new episode is introduced. Such is the music’s urgency that the eventual reprise of the main rondo theme is short-lived, and the music plunges almost immediately into the minor for an intense development of the rondo theme, with a running accompaniment in constant semiquavers. The influence of that accompaniment makes itself felt during the more animated final reprise, too; not even the sudden intervention of two bars of adagio can more than momentarily stem the music’s irrepressible flow. Mozart entered the Sonata in A major, K526, in his running catalogue of works on 24 August 1787, just a fortnight after Eine kleine Nachtmusik. 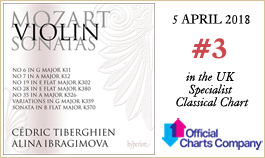 It is one of the most dazzling of all his works of the kind, with outer movements in exceptionally quick tempi, and everywhere a feeling that the composer is revelling in the effortless mastery of his linear counterpoint. The opening movement’s main theme owes its impetus at least in part to intriguing cross-rhythms, set up in its first half by a chain of two-note phrases that cut across the underlying three-note beat; and in its second half, by a series of syncopations whose impression of dislocating the beat is still stronger. The main unifying element behind the piece is the descending scale figure with which it begins. The scale is echoed in ascending form during the theme’s second half, and it returns in a delicate staccato as a transition leading towards the exposition’s second stage. The second subject itself is largely formed out of the same figure, and only the tiny chromatic idea which rounds off the exposition departs significantly from the pattern. It is this last idea, together with the main subject’s initial descending scale, that Mozart takes as the basis of the central development section. The intricate counterpoint that has threaded its way so unostentatiously through the movement reaches a climax at the approach to the recapitulation, where the main theme’s initial phrase is played in tightly knit canon between the two instruments. Following this passage the music settles on a long-repeated pedal note, while the little chromatic idea is thrown back and forth between the players, before the main subject’s scale figure is presented in a descending sequence which plunges with splendid energy straight into the recapitulation. Weaving its way through the slow movement is the gently rocking figure in bare octaves with which the piano sets the piece in motion. The figure sounds for all the world like an accompaniment played on its own; and yet when the violin enters in the second bar, it is with a halting phrase that is itself scarcely more thematic. It is this deliberate ambiguity between what is thematic and what accompanimental, as well as the sparse texture of parallel octaves, that underlies the piece. The long opening paragraph is eventually followed by a sudden turn to the minor, for a melancholy new theme replete with Mozart’s beloved ‘Neapolitan’ tinges, played against a more conventional form of accompaniment. The return to the major brings with it a renewal of the movement’s opening quasi-accompanimental figure, which is soon given out by the piano in a new syncopated form which has the right hand shadowing the left with a fraction of a second’s delay. Mozart chooses to use this syncopated version to launch the recapitulation. The breathless finale takes as its point of departure a theme from a trio sonata by Carl Friedrich Abel—the German composer and gamba player who spent the last three decades of his life in London. Abel died some two months before Mozart composed his sonata, K526, and it is likely that he intended its finale as a tribute to a musician he had admired ever since his own early visit to London. Mozart’s finale contains no fewer than four recurring themes, the last of them a chromatic idea in warm parallel thirds, whose calmness contrasts with the bubbling energy of the surrounding material. As if this were not enough, the central episode quietly introduces an expressive new violin melody in the melancholy key of F sharp minor. As he almost invariably does in his rondos, Mozart alters the pattern of thematic events following that developmental episode, reserving the last word for the reappearance of the main rondo theme itself. Early in 1789, just a few months after he had completed his great divertimento for string trio, K563, Mozart composed his penultimate Piano Sonata in B flat major, K570. Its lean contrapuntal textures seem to reflect something of the experience gained in writing the string trio, and its opening theme—nothing more than an elongated arpeggio given out quietly in bare octaves—recalls the divertimento’s similarly understated beginning. When the sonata appeared in print, some five months after Mozart’s death, it had acquired an accompaniment for violin. In this version the work was included among Mozart’s violin sonatas throughout the nineteenth century and a good deal of the twentieth, even though the violin part is patently not authentic: Mozart’s own catalogue entry is clearly labelled as ‘Eine Sonate auf Klavier allein’ (‘A Sonata for piano solo’) and the surviving portion of his autograph score contains no trace of a violin part. In the case of the first movement, the violin part of the first edition is quite skilfully put together, with the second subject’s contrapuntal texture enhanced through the addition of a canonic voice answering the piano’s left-hand part, and the approach to the recapitulation lent additional tension by means of dramatic tremolos. Rather less happy are the violin’s contributions to the slow movement’s two episodes—the first of them overlain with a virtuoso patter of semiquaver triplets, and the second with a sentimental pizzicato accompaniment in imitation of a guitar. Here, as indeed elsewhere in the sonata, the simplicity and economy of means in Mozart’s original are to be preferred. But if nothing else, the sonata’s first edition shows us that the genre of the accompanied piano sonata was still alive and well in the last decade of the eighteenth century. Dans l’andante initial élaboré de la Sonate en la majeur, K12, une figure ascendante en arpège à la main gauche du clavier, reprise par le violon, ponctue le discours musical jusqu’à ce que, dans les derniers moments de chaque moitié du morceau, l’arpège soit remplacé par une gamme très rapide. Le seul autre mouvement est un allegro animé dont la reprise finale est précédée d’un passage en mineur qui apporte une touche de chromatisme exotique. La Sonate en sol majeur, K11, est également en deux mouvements, mais le second, qui suit un andante expressif, est en vérité une paire de pièces contrastées réunies en une seule—un allegro binaire rapide et un menuet en mineur basé sur un thème étroitement apparenté. À la fin du menuet, il y a une reprise de l’allegro. Les premières sonates avec accompagnement de Mozart furent complétées à La Haye, en février 1766, par un autre recueil de six œuvres, K26-31. Plus de dix ans s’écoulèrent ensuite avant qu’il revienne à ce genre au cours d’une tournée qu’il entreprit en 1777-78 sous l’œil vigilant de sa mère (qui mourut cependant avant que Mozart retourne chez lui). Des six nouvelles sonates K301-306, quatre furent composées à Mannheim au cours des premiers mois de l’année 1777 et deux furent ajoutées à Paris pendant l’été. En plus de celles-ci, Mozart composa une autre sonate, K296, qui ne fut publiée qu’en 1781. Toutes les sonates de Mannheim et de Paris, sauf la dernière, ne comportent que deux mouvements. Dans le premier mouvement de la Sonate en mi bémol majeur, K302, Mozart tente de recréer le son du célèbre orchestre de la cour de Mannheim et, en particulier, le long crescendo sur une pédale répétée qui était l’un des effets caractéristiques de cet orchestre. Le sujet initial, avec son début dans le style d’une fanfare auquel répond une idée plus douce, mène à un long crescendo dont le volume sonore augmente soigneusement pendant presque une douzaine de mesures. Le crescendo est suivi d’une calme évocation de cors au violon et d’une série de phrases expressives en mode mineur au piano. Les phrases expressives du piano encadrent le développement, dont la phase centrale présente un retour spectaculaire de la fanfare initiale du mouvement, accompagnée de tremolos du violon qui évoquent le son des cordes de l’orchestre. La fanfare apparaît à ce point dans le véritable style Sturm und Drang, à la fois sous sa forme originale et—en un autre geste caractéristique de Mannheim—à l’envers. C’est aussi avec la même fanfare que se concluent l’exposition et la réexposition. Le finale est un rondo décontracté dont l’épisode contrasté est une idée staccato qui trébuche délicatement, présentée pour l’essentiel dans une mince texture à deux voix, le violon doublant la ligne supérieure du clavier à l’octave inférieure. À la fin, le thème du rondo, avec son rythme dactylique caractéristique, se transforme en un sujet final d’une beauté attendrissante, exposé au piano en octaves fluides sur un accompagnement de violon légèrement balancé. Les Variations en sol majeur sur «La bergère Célimène», K359, furent composées au cours de l’été 1781, probablement pour la comtesse Maria Karolina Rumbeke, qui fut la première élève de piano de Mozart après son arrivée à Vienne au mois de mars de cette même année. Mozart dut trouver la mélodie, ainsi que celle d’autres variations pour piano et violon, Auprès d’une source (K360), écrites vers la même époque, dans les recueils réunis par le castrat et compositeur Antoine Albanese. Le thème de la chanson «La bergère Célimène» est d’une très grande simplicité. Dans la seconde moitié, il y a un bref silence après un point d’orgue, qui se retrouve aussi dans les variations elles-mêmes; Mozart laissait peut-être ainsi à l’instrumentiste la possibilité d’improviser des cadences miniatures en ces endroits. Des douze variations, la troisième est un solo de piano avec une partie de main gauche entièrement en doubles croches, alors que la septième est une marche vigoureuse en mineur. L’avant-dernière variation est un adagio dont la mélodie ornée du piano est accompagnée en pizzicato; l’œuvre s’achève sur un allegro qui donne à la mélodie en forme de gavotte un rythme plus animé. Le nom d’une autre élève de Mozart, Josepha Auernhammer, apparaît sur la page de titre d’un recueil de six sonates édité en décembre 1781 par la firme viennoise Artaria, comme l’«Œuvre II» de Mozart. Auernhammer était manifestement une bonne instrumentiste: «La jeune fille est à faire peur!», dit Mozart à son père, «mais joue à merveille; seul le style chantant vraiment délicat dans le cantabile lui échappe.» Mozart joua avec Auernhammer son concerto pour deux pianos, K365, et composa pour elle l’étincelante sonate pour deux pianos, K448. La Sonate en mi bémol majeur, K380, la dernière de la série d’Auernhammer, débute sur une succession d’accords impérieux à la tonique, dont le second se trouve à l’octave inférieure du premier. Les accords constituent des signes de ponctuation au cours du morceau, leur apparition annonçant presque toujours un changement saisissant de tonalité. Le développement central commence par prendre une autre direction, avec une idée de fanfare au piano; mais les accords reviennent bientôt, menant à un passage dramatique en mineur. Juste à la fin du développement, les accords sont soumis à un pianissimo soudain et présentés en valeur de notes deux fois plus longues qu’à l’origine—un effet qui donne un élan supplémentaire au début de la réexposition. Le mouvement lent en sol mineur, avec son thème principal aux appoggiatures «gémissantes», a une ambiance pathétique émouvante et son atmosphère anticipe le mouvement lent en forme de variations, également en sol mineur, du concerto pour piano K456 de Mozart. La tonalité initiale n’est pas conservée longtemps, mais le passage au mode majeur amène avec lui une forme à peine modifiée de la même mélodie; alors que vers la fin de la première moitié du mouvement, le thème—encore en majeur—prend une forme ascendante qui donne une impression encore plus grande de désir intense. La section centrale introduit une nouvelle idée, accompagnée au piano d’une manière qui évoque un murmure de clarinettes. La musique prend peu à peu de l’intensité, jusqu’à ce qu’une gamme chromatique ascendante mène à la reprise. Cette fois, il n’y a pas de passage au majeur après le thème principal. À la place, sur l’accompagnement d’une ligne sinueuse au piano, le violon continue à développer le contour du thème—et en particulier, son appoggiature gémissante. L’impression produite par le procédé qu’utilise Mozart en repoussant le développement mélodique de la musique jusqu’à cette phase ultérieure au lieu de le maintenir dans sa position normale au début de la seconde moitié du mouvement est renforcée par le fait que le véritable développement se compose de matériel entièrement nouveau. Le thème de «chasse» du finale annonce le rondo du concerto pour piano dans la même tonalité K482. La fin du thème, juste avant la première entrée du violon, comporte non seulement un brusque crescendo, mais aussi une accélération rythmique résultant d’une série de sauts d’octaves qui changent la répartition de la mesure (trois groupes de deux croches au lieu de deux groupes de trois croches chacun). Une fois terminée l’exposition du long paragraphe initial, Mozart ajoute une fanfare qui semble faire sonner ensemble des cors et des trompettes, avant l’introduction d’un nouvel épisode. L’urgence de la musique est telle que la reprise du thème principal du rondo qui finit par arriver ne dure pas longtemps, et la musique plonge presque d’emblée dans le mode mineur pour un intense développement du thème du rondo, sur un accompagnement ininterrompu en doubles croches régulières. L’influence de cet accompagnement se fait également sentir au cours de la reprise finale plus animée; même l’intervention soudaine de deux mesures d’adagio ne parvient à enrayer que momentanément le flux irrépressible de la musique. Mozart inscrivit la Sonate en la majeur, K526, dans le catalogue de ses œuvres qu’il tenait régulièrement à la date du 24 août 1787, juste deux semaines après Eine kleine Nachtmusik («Petite musique de nuit»). C’est l’une de ses compositions les plus éblouissantes du genre, avec des mouvements externes dans des tempos exceptionnellement rapides, et partout l’impression que le compositeur se délecte de la maîtrise naturelle de son contrepoint linéaire. Le thème principal du premier mouvement doit son élan au moins en partie à la polyrythmie fascinante, créée dans sa première moitié par un enchaînement de phrases de deux notes qui ne tiennent pas compte du rythme ternaire; et dans sa seconde moitié, par une série de syncopes qui donnent encore davantage l’impression de disloquer le rythme. Le principal élément de cohésion de ce morceau est la figure de gamme descendante par laquelle il commence. La gamme réapparaît sous forme ascendante au cours de la seconde moitié du thème et elle revient dans un délicat staccato comme transition vers la seconde phase de l’exposition. Le second sujet lui-même est issu pour l’essentiel de la même figure et seule la toute petite idée chromatique qui met fin à l’exposition s’écarte sensiblement du modèle. C’est cette dernière idée, avec la gamme descendante initiale du sujet principal, que Mozart prend pour base du développement central. Le contrepoint complexe qui s’est faufilé de manière si discrète dans le mouvement atteint un point culminant à l’approche de la réexposition, où la phrase initiale du thème principal fait l’objet d’un canon étroitement soudé entre les deux instruments. À la suite de ce passage, la musique s’installe sur une pédale longue et répétée, alors que la petite idée chromatique fait des allées et venues entre les instrumentistes, avant que la figure de gamme du sujet principal apparaisse dans une séquence descendante qui plonge directement dans la réexposition avec une formidable énergie. Le mouvement lent commence sur une figure doucement balancée en octaves dépouillées au piano qui serpente à travers l’ensemble de la pièce. Cette figure a tout à fait l’air d’un accompagnement à lui seul; pourtant, lorsque le violon entre à la deuxième mesure, c’est sur une phrase hésitante, elle-même à peine plus thématique. La pièce est sous-tendue par cette ambiguïté délibérée entre le thématique et l’accompagnement, ainsi que par la minceur d’une texture en octaves parallèles. Le long paragraphe initial est finalement suivi d’un passage soudain en mineur, pour un nouveau thème mélancolique aux teintes «napolitaines» chères à Mozart, joué sur une forme plus conventionnelle d’accompagnement. Le retour au majeur survient avec la présentation sous un jour nouveau de la figure initiale du mouvement qui ressemblait à un accompagnement, bientôt reprise au piano sous une nouvelle forme syncopée, la main droite prenant la gauche en filature avec un retard d’une fraction de seconde. Mozart choisit d’utiliser cette version syncopée pour lancer la réexposition. Le finale haletant prend pour point de départ un thème d’une sonate en trio de Carl Friedrich Abel—le compositeur et gambiste allemand qui passa les trente dernières années de sa vie à Londres. Abel mourut environ deux mois avant que Mozart compose sa sonate, K526, et il est probable qu’il ait voulu faire de son finale un hommage à un musicien qu’il admirait depuis sa propre première visite à Londres. Le finale de Mozart contient au moins quatre thèmes récurrents, le dernier étant une idée chromatique en tierces parallèles chaleureuses, dont le calme contraste avec l’énergie débordante du matériel qui l’entoure. Comme si ce n’était pas suffisant, l’épisode central introduit calmement une nouvelle mélodie expressive du violon dans la tonalité mélancolique de fa dièse mineur. Comme il le fait presque toujours dans ses rondos, Mozart modifie le déroulement des événements thématiques qui suivent cet épisode de développement, laissant le dernier mot à la réapparition du thème principal du rondo lui-même. Au début de l’année 1789, quelques mois seulement après avoir terminé son grand divertimento pour trio à cordes, K563, Mozart composa son avant-dernière Sonate pour piano en si bémol majeur, K570. La ténuité des textures contrapuntiques semble refléter une part de l’expérience acquise avec le trio à cordes, et son thème initial—rien de plus qu’un arpège allongé exposé calmement en octaves nues—rappelle le début tout aussi discret du divertimento. Lorsque cette sonate fut publiée, cinq mois environ après la mort de Mozart, elle était dotée d’un accompagnement au violon. Dans cette version, l’œuvre fut incluse dans les sonates pour violon et piano de Mozart tout au long du XIXe siècle et pendant une bonne partie du XXe siècle, même si, de toute évidence, la partie de violon n’est pas authentique: l’entrée du propre catalogue de Mozart mentionne clairement «Eine Sonate auf Klavier allein» («Une sonate pour piano seul») et les fragments de sa partition autographe qui nous sont parvenus ne contiennent pas la moindre trace d’une partie de violon. Dans le cas du premier mouvement, la partie du violon de la première édition est très habilement réalisée, la texture contrapuntique du second sujet étant mise en valeur par l’ajout d’une voix en canon qui répond à la partie de main gauche du piano et, à l’approche de la réexposition, des trémolos dramatiques ajoutent une tension supplémentaire. Moins heureuses sont les contributions du violon aux deux épisodes du mouvement lent—le premier étant recouvert d’un crépitement de triolets en doubles croches et le second d’un accompagnement pizzicato sentimental imitant la guitare. Ici, comme ailleurs dans la sonate, on préférera la simplicité et l’économie de moyens de l’original mozartien. Mais, à tout le moins, la première édition de la sonate nous montre que le genre de la sonate pour piano avec accompagnement perdurait encore et se portait plutôt bien au cours des dix dernières années du XVIIIe siècle. In dem aufwendigen Eingangssatz (ein Andante) der Sonate A-Dur, KV12, durchzieht ein aufsteigendes Arpeggio in der linken Hand der Klavierstimme, welches von der Geige nachgeahmt wird, den musikalischen Diskurs, bis in den Schlusstakten der beiden Hälften des Stücks an die Stelle des Arpeggios jeweils eine eilende Tonleiterpassage tritt. Bei dem zweiten (und gleichzeitig letzten) Satz handelt es sich um ein lebhaftes Allegro, dessen abschließender Reprise ein Wechsel nach Moll vorangeht, welcher für ein wenig exotische Chromatik sorgt. Die Sonate G-Dur, KV11, ist ebenfalls in zwei Sätzen angelegt, wobei jedoch der letztere, der auf ein expressives Andante folgt, tatsächlich aus zwei gegensätzlichen Stücken besteht, die sich zu einem Ganzen verbinden—ein flottes Allegro in Zweiertakt und ein Menuett in Moll, dem ein nahverwandtes Thema zugrunde liegt. Wenn das Menuett seinen Lauf genommen hat, wird das Allegro wiederholt. Im Februar 1766 schloss Mozart die Werkserie seiner begleiteten Jugendsonaten mit einem weiteren Sechserzyklus, KV26-31, in Den Haag ab. Danach sollte mehr als ein Jahrzehnt vergehen, bevor er sich dem Genre erneut widmete, diesmal auf einer Reise, die er 1777-78 in Begleitung seiner Mutter unternahm, die jedoch unterwegs starb. Von den sechs Sonaten KV301-306 entstanden vier in Mannheim zu Beginn des Jahres 1777 und zwei weitere wurden in Paris im Sommer des Jahres hinzugefügt. Darüber hinaus komponierte Mozart eine weitere Sonate, KV296, die jedoch erst 1781 veröffentlicht wurde. Alle bis auf die letzte dieser Mannheimer und Pariser Sonaten sind ebenfalls zweisätzig angelegt. Im Anfangssatz der Sonate Es-Dur, KV302, unternimmt Mozart den Versuch, den Klang der berühmten Mannheimer Hofkapelle nachzubilden, insbesondere das lange Crescendo über einem wiederholten Orgelpunkt, welches zu den Markenzeichen des Orchesters gehörte. Das Anfangsthema, ein fanfarenartiger Beginn gefolgt von einem weicheren Motiv, leitet in ein langes Crescendo hinein, dessen Klangbild sorgfältig über eine Spanne von fast zwölf Takten aufgebaut wird. Nach dem Crescendo deutet die Geige sanft Hörner an und das Klavier spielt eine Reihe von expressiven Moll-Phrasen. Diese Phrasen rahmen die Durchführung ein, in deren Mittelpunkt eine dramatische Rückkehr der Anfangsfanfare steht, begleitet von Geigentremoli, mit denen der Streicherapparat eines Orchesters heraufbeschworen wird. Die Fanfare erklingt hier in echter Sturm-und-Drang-Manier, sowohl in ursprünglicher Form, als auch—was wiederum charakteristisch für die Mannheimer Schule ist—umgekehrt. Mit eben jener Fanfare werden dann sowohl die Exposition als auch die Reprise abgeschlossen. Das Finale ist ein unbeschwertes Rondo, dessen kontrastierende Episode aus einem grazil tippelnden Staccato-Motiv besteht, welches zumeist in einer sparsamen zweistimmigen Faktur in Erscheinung tritt, wobei die Geige die Oberstimme des Klaviers eine Oktave tiefer verdoppelt. Am Ende verwandelt sich das Rondothema mit seinem charakteristischen daktylischen Rhythmus in ein Schlussthema von erweichender Schönheit, das vom Klavier in geschmeidigen Oktaven gespielt wird, während die Violine für eine sanft wiegende Begleitung sorgt. Die Variationen G-Dur über „La bergère Célimène“, KV359, entstanden im Sommer 1781, wahrscheinlich für die Gräfin Maria Karolina de Thiennes et de Rumbeke, Mozarts erste Klavierschülerin in Wien; er war im März des Jahres in der Residenzstadt angekommen. Die Melodie, wie auch diejenige, die einem weiteren Variationenwerk für Klavier und Violine aus derselben Zeit, Auprès d’une source (KV360), zugrunde liegt, entstammt einer Sammlung des Kastraten und Komponisten Antoine Albanese. Das Thema der Chanson „La bergère Célimène“ ist äußerst schlicht. In der zweiten Hälfte erfolgt bei einer Fermate eine kurzzeitige Pause, die auch in den Variationen selbst vorkommt, und es ist gut möglich, dass Mozart an diesen Stellen kurze, improvisierte Kadenzen vom Interpreten erwartete. Von den zwölf Variationen ist die dritte für Klavier solo, wobei die linke Hand durchgehend in Sechzehnteln gehalten ist, und die siebte ist ein kraftvoller Marsch in Moll. Die vorletzte Variation ist ein Adagio, dessen verzierte Klaviermelodie von einem Pizzicato begleitet wird; das Werk endet mit einem Allegro, das die gavotteartige Melodie in einen lebhafteren Rhythmus verwandelt. Auf der Titelseite eines Zyklus von sechs Sonaten, der im Dezember 1781 bei dem Wiener Verlag Artaria als Mozarts „Oeuvre II“ herauskam, ist der Name einer weiteren Mozartschülerin aufgeführt: Josepha Auernhammer. Offensichtlich war sie eine begabte Instrumentalistin—Mozart schrieb an seinen Vater: „die freulle ist ein scheusal!—spiellt aber zum entzücken; nur geht ihr der Wahre feine, singende geschmack im Cantabile ab; sie verzupft alles.“ Mozart führte sein Konzert für zwei Klaviere KV365 mit Auernhammer zusammen auf und komponierte auch die perlende Sonate für zwei Klaviere KV448 für sie. Die Sonate Es-Dur, KV380, die letzte der Auernhammer-Sonaten, beginnt mit gebieterischen Tonika-Akkorden, die jeweils um eine Oktave hinabsteigen. Die Akkorde fungieren im Laufe des Werks als Ausrufezeichen, und wo sie auftreten, kündigen sie fast immer einen überraschenden Tonartenwechsel an. Die Durchführung strebt zunächst mit einer fanfarenartigen Idee für Klavier eine neue Richtung an, doch die Akkorde kehren bald wieder und führen in eine dramatische Mollpassage hinein. Ganz am Ende der Durchführung erklingen die Akkorde in einem plötzlichen Pianissimo und doppelt so lang wie ursprünglich—ein Effekt, der den Beginn der Reprise umso schwungvoller erscheinen lässt. Der langsame Satz in g-Moll mit seinen Seufzerfiguren im Hauptthema strahlt eine anrührende Stimmung des Pathos aus und die Atmosphäre nimmt den langsamen Satz von Mozarts Klavierkonzert KV456, ebenfalls in g-Moll, vorweg. Die Tonart des Beginns wird nicht lang beibehalten, doch der Wechsel nach Dur verändert die Form der Melodie kaum; gegen Ende der ersten Hälfte des Satzes nimmt das Thema—immer noch in Dur—eine aufsteigende Form an, die eine noch größere Sehnsucht ausdrückt. Im Mittelteil wird eine neue Idee vorgestellt, die von dem Klavier derartig begleitet wird, dass sich ein Eindruck von raunenden Klarinetten einstellt. Die Musik nimmt allmählich an Intensität zu, bis eine aufsteigende chromatische Tonleiter in die Reprise hinüberleitet. Diesmal erfolgt nach dem Hauptthema kein Wechsel nach Dur. Stattdessen entwickelt die Violine zu der sich schlängelnden Klavierbegleitung die Konturen des Themas weiter, wobei die Seufzerfiguren besonders betont werden. Der Eindruck, dass Mozart die melodische Durchführung von der üblichen Position zu Beginn der zweiten Hälfte des Satzes nach hinten verlegt hat, verstärkt sich aufgrund der Tatsache, dass die wahre Durchführung aus völlig neuem Material besteht. Das „Jagdthema“ des letzten Satzes ist ein Vorläufer des Rondos in dem Klavierkonzert KV482, welches in derselben Tonart steht. Der Schlussteil des Themas, der direkt vor dem ersten Einsatz der Violine erklingt, tritt nicht nur mit einem plötzlichen Crescendo auf, sondern auch mit einer rhythmischen Beschleunigung, die sich aus einer Reihe von Oktavsprüngen ergibt, welche eine Veränderung der Taktaufteilung von zwei Dreiachtelgruppen zu drei Zweiachtelgruppen mit sich bringt. Sobald die ausgedehnte Einleitung abgeschlossen ist, lässt Mozart eine Fanfare erklingen, die sowohl von Hörnern als auch von Trompeten geschmettert zu werden scheint, bevor eine neue Episode eingeleitet wird. Die Musik drängt voran, die Reprise des Rondothemas ist von nur kurzer Dauer und fast unmittelbar erfolgt ein Wechsel nach Moll, worauf eine intensive Durchführung des Rondothemas mit einer durchgängigen Sechzehntel-Begleitung beginnt. Der Einfluss dieser Begleitung macht sich in der lebendigeren Reprise ebenfalls bemerkbar—nicht einmal der plötzliche Einschub von zwei Adagio-Takten kann das unbezähmbare Fließen der Musik mehr als vorübergehend eindämmen. Mozart trug die Sonate A-Dur, KV526, am 24. August 1787, nur zwei Wochen nach der Kleinen Nachtmusik, in sein Werkeverzeichnis ein. Sie gehört zu den strahlendsten Werken ihrer Art in Mozarts Oeuvre; die Rahmensätze haben außergewöhnlich schnelle Tempi und überall stellt sich der Eindruck ein, der Komponist schwelge in der mühelosen Meisterhaftigkeit seines linearen Kontrapunkts. Seine Triebkraft verdankt das Hauptthema des ersten Satzes mindestens teilweise den faszinierenden Rhythmen, die sich in seiner ersten Hälfte durch eine Kette von Zweitonfiguren ergeben, welche den darunterliegenden Dreierrhythmus durchkreuzen; in der zweiten Themenhälfte wird der Eindruck des versetzten Taktschlags durch eine Reihe von Synkopen noch verstärkt. Das Element, welches in dem Stück am meisten Einheit stiftet, ist die abwärts gerichtete Tonleiterfigur, die zu Beginn erklingt. Diese Tonleiter kommt in der zweiten Themenhälfte in aufsteigender Form vor und kehrt zudem in einem zarten Staccato als Überleitung zum zweiten Teil der Exposition wieder. Das zweite Hauptthema selbst besteht zu großen Teilen aus derselben Figur; nur das winzige chromatische Motiv, mit dem die Exposition abgerundet wird, weicht erheblich von dem Muster ab. Eben dieses letzte Motiv und die absteigende Tonleiter des Hauptthemas bilden die Grundlage für die zentrale Durchführung. Der komplizierte Kontrapunkt, der sich so dezent durch den Satz gezogen hat, erreicht kurz vor der Reprise einen Höhepunkt, wenn die Anfangsphrase des Hauptthemas als dicht gearbeiteter Kanon zwischen den beiden Instrumenten erklingt. Nach dieser Passage beruhigt sich die Musik auf einem langen Orgelpunkt, während das kleine chromatische Motiv zwischen den Instrumenten hin- und hergeworfen wird, bevor die Tonleiterfigur des Hauptthemas in absteigender Sequenz erklingt, die dann direkt und voll sprühender Energie in die Reprise übergeht. Durch den langsamen Satz schlängelt sich die sanft wiegende Figur in leeren Oktaven, mit der das Klavier das Stück beginnt. Diese Figur erscheint zunächst gänzlich als allein gespielte Begleitung; wenn jedoch die Violine im zweiten Takt einsetzt, so wirkt ihre stockende Phrase kaum thematischer. Diese absichtliche Unklarheit, was als thematisches Material und was als Begleitung zu verstehen ist, wie auch die karge Textur der Oktavparallelen, charakterisiert dieses Stück. Auf die lange Eröffnungsteil folgt schließlich ein plötzlicher Wechsel nach Moll, wo ein melancholisches neues Thema voller „neapolitanischer“ Andeutungen, die Mozart so liebte, zu einer konventionelleren Form der Begleitung erklingt. Wenn die Musik nach Dur zurückkehrt, wird gleichzeitig das begleitungsartige Motiv vom Beginn des Satzes erneuert: das Klavier spielt nun eine synkopierte Figur, in der die rechte Hand die linke mit einer Verzögerung eines Bruchteils einer Sekunde imitiert. Mit dieser synkopierten Version eröffnet Mozart auch die Reprise. Der Ausgangspunkt des atemlosen Finales ist ein Thema aus einer Triosonate von Carl Friedrich Abel—der deutsche Komponist und Gambenspieler, der die letzten drei Dekaden seines Lebens in London verbrachte. Abel starb etwa zwei Monate bevor Mozart seine Sonate KV526 komponierte, und es ist anzunehmen, dass dieses Finale als Hommage an einen Musiker gedacht war, den er seit seinem ersten London-Aufenthalt bewundert hatte. In Mozarts Finale erklingen nicht weniger als vier mehrfach wiederkehrende Themen, von denen das letzte eine chromatische, in warmen Terzparallelen verlaufende Figur ist, deren innere Ruhe sich von der überschäumenden Energie des umliegenden Materials abhebt. Doch damit nicht genug—die zentrale Episode leitet leise eine neue, ausdrucksvolle Geigenmelodie in der melancholischen Tonart fis-Moll ein. Wie er es fast immer in seinen Rondos hält, passt Mozart die Abfolge der thematischen Ereignisse derjenigen der Durchführungsepisode an und behält das letzte Wort dem wiederkehrenden Rondothema vor. Zu Beginn des Jahres 1789, nur wenige Monate nachdem er sein großes Divertimento für Streichtrio, KV563, beendet hatte, komponierte Mozart seine vorletzte Klaviersonate B-Dur, KV570. Die schlanken kontrapunktischen Strukturen scheinen einige der Erfahrungswerte widerzuspiegeln, die er bei der Komposition des Streichtrios gesammelt hatte, und das Eröffnungsthema—nicht mehr als ein verlängertes Arpeggio, das in leeren Oktaven erklingt—erinnert an den ähnlich diskreten Beginn des Divertimentos. Als die Sonate etwa fünf Monate nach Mozarts Tod im Druck erschien, hatte sie eine begleitende Geigenstimme hinzugewonnen. In dieser Version zählte man das Werk im 19. und auch noch im 20. Jahrhundert zu den Violinsonaten Mozarts, obwohl die Geigenstimme offenkundig nicht authentisch ist: Mozarts eigener Eintrag in sein Werkeverzeichnis lautet „Eine Sonate auf Klavier allein“, und die überlieferten Teile seines Manuskripts enthalten keinerlei Spur einer Geigenstimme. Im Falle des ersten Satzes ist der Geigenpart der ersten Ausgabe recht geschickt konstruiert. Die kontrapunktische Struktur des zweiten Themas wird durch die Ergänzung einer kanonischen Stimme, die auf die linke Hand des Klavierparts reagiert, aufgewertet, und die Vorbereitung auf die Reprise wirkt durch dramatische Tremoli umso spannender. Weniger geglückt sind die Beiträge der Violine zu den beiden Episoden des langsamen Satzes—die erste wird von virtuosem Sechzehnteltriolen-Geprassel und die zweite durch eine sentimentale Pizzicato-Begleitung im Gitarrenstil überlagert. Hier, wie auch anderswo in der Sonate, ist die Schlichtheit und Ökonomie der Mittel von Mozarts Original vorzuziehen. Davon jedoch abgesehen demonstriert die erste Ausgabe dieser Sonate, dass das Genre der begleiteten Klaviersonate in der letzten Dekade des 18. Jahrhunderts durchaus noch gang und gäbe war.